Hi! It's the start of a new week! This card is made with Stamping Bella "Uptown Girls Clarissa and Camille share a café". Yet another image that is so much fun to colour! I was left with a blank space on the left of the card so I looked to the coffee cup for inspiration. Just some simple little layered punched circles.. I'm going to enter this card in the "Penny Black and More" challenge "One for the Girls". 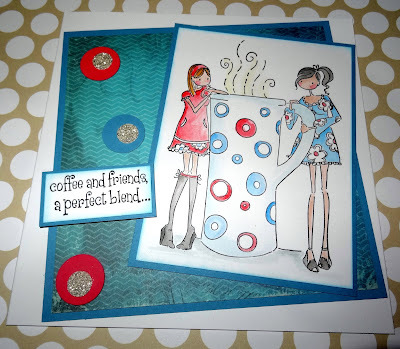 Gorgeous card with girlfriends and cafe, just perfect for our theme.